After weeks of controversy, articles, talking head pundits, and an opinion from (seemingly) every human in the USA, I finally bought my ticket and saw Noah. I want to be clear upfront that I intentionally avoided reviews and articles to form my own opinion. Obviously, writing a blog about movies and the Bible makes this film a perfect choice, so I gladly dropped $19 for my wife and me to see it. Warning, there are minor spoilers in this review, but I did go to great lengths to not reveal too much of the story. What did I think? Well, we will get to that, but first an interesting tidbit. 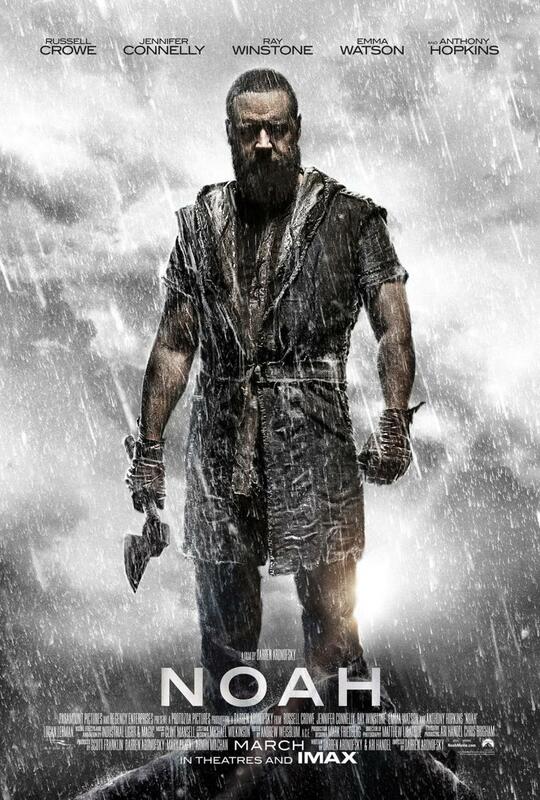 I heard about Noah through the usual movie websites, rumors, etc. It touched home one day last year while sitting in one of my professor’s office, reading Akkadian, when the phone rang. He told them he did not have time to speak with them because he was working with students. We prodded him to tell us who it was and said it was a journalist asking him to give a quote regarding the Noah movie. One thing the film did very well was capture the world and feeling of what is known as the “primeval history” of Genesis, found in chapters one through eleven. This time period is so ancient that readers cannot grasp the world portrayed in the text and the movie. This is a time of giants walking the Earth, and divine creatures that mix with humans (an element found in the film). These chapters are written as a pre-history, a type of fantastical time in which giants still roamed the earth and humans lived for centuries. This is portrayed in the movie with unrecognizable creatures, and elements of “fire rocks,” that are not explained. This gives the film a quality akin to a fantasy film, and on many levels, that is the world the primeval history portrays. It enhances the ancientness of the text, allowing the viewer to be drawn into a world vastly different from our own. Along the same lines as the primeval history, I think it was a smart move to constantly reference back to Adam. Most people may be shocked to know this, but outside of the Garden narrative itself and some genealogies, Adam’s significance is next to nothing in the Hebrew Bible. By referencing the Garden of Eden and Adam, the film continues to play on the theme of creation. An interesting aspect that I noticed was the constant reference to the “Creator,” instead of “God.” I thought this was an interesting choice. Now I can already hear the criticisms: This is taking God out of the story, this is secularizing the narrative, etc. However, from a biblical perspective, this is, I would argue, more accurate. If you follow the events, Noah’s episode is long before Moses’ (major covenant), and before Abraham’s (first covenant with Israel). In fact, the Tetragrammatron (YHWH) is not revealed to humans until Moses, therefore the patriarchs of Genesis and the characters of the primeval history do not know the name of God. Pre-covenant, it only makes sense they would refer to “Him” as “Creator.” Applying the term God would border on anachronistic. Did this mean I enjoyed every aspect of the film? Well no, some parts were a little different. Again, because I am attempting to be as spoiler-free as possible, I will not reveal too much. First, a big point of controversy for many is the purpose of the flood. Sticking with the original story, the main reason is the wickedness of humankind, however Aronofsky nuances this notion further. In this story, the animals and their protection against humans is key, suggesting a strong theme for vegetarianism. While some people will take issue with this aspect of the story (I personally do not agree with it), it is still a solid and interesting interpretation of the material. It is especially clever when the antagonists of the film use other biblical material (the dominion over the Earth) to argue against Noah, thus establishing (though somewhat flimsy) a conflict that legitimately exists in the text itself. One piece of criticism I was unable to avoid before seeing the film was that the filmmakers took an “environmental” stance with the story. Having seen the film, I can honestly say that this depiction is inaccurate. The care of animals and respect of the natural world is prominent, but at no point is there any message of humans wrecking the environment. The film suggests part of the wickedness of man was due to intense industrialization, but it still does not connect that point to the environment itself. Honestly, Peter Jackson’s Lord of the Rings trilogy had a more overt environmental message than Arnofsky’s Noah. Secondly, while I understand that any film based off prior material is an interpretation, thus some liberties will inevitably be taken, I found some plot devices to be a bit too predictable and typical Hollywood. Actions by the main villain and internal family strife were a bit old hat, though played convincingly enough by the actors. I will say that the third act of the film, which is 95% from the filmmakers and not the source material, was quite a stretch, albeit very intense on an emotional level. Considering Arnofsky’s other work (The Fountain, Black Swan, etc.) this film comes across as somewhat tame. If you have seen his movies before, you know you are in for a visual treat and creative story telling. The film’s relation to the feel of the biblical material was, in my opinion, spot-on and his chosen hermeneutic, though preachy with the vegetarianism, works as a fresh take. The film strikes a good balance between striking visuals, large-scale action, and interesting human drama and characters. Easy four and half stars, check it out! Disagree? Agree? Confused? Sound off below, and as always, thanks for reading. This entry was posted in Movies, Religion and tagged Adam, Arnofsky, Bible, Biblical Interpretation, Biblical Story, Cain, Creation, Creator, film, Flood, Genesis, God, Movie Review, Noah, Noah movie, Primordial History, Vegetarian. Bookmark the permalink. Thank you Andrew, I found this review to be the most thorough and unbiased I have read thus far. I have read several, and I always take them with a “grain of salt”, so to speak. I wanted to see the movie earlier and I want to see it even more now. I am not a Biblical scholar and probably never will be. I simply want to see the movie, unlike others, who want to disect it as far as the references to the Bible are concerned. I have so many other things I see every single day that I can worry about such as if the children who live across town have enough to eat. Well put Sandy! Thank you for the kind words as well! The movie is certainly worth a view in my opinion. Let me know what you think when you get around to seeing it!